Earlier this year, the state re-opened Sitka’s public assistance office — to the relief of many. When the office was closed, the welfare caseload became severely backlogged. Locals who rely on benefits were not able to quickly renew, pushing many over the edge. Sitka’s pantries were put to the test. Blossom Twitchell pulled back a curtain, revealing Sitka Tribe of Alaska’s pantry. “We have crackers and rice and noodles and chili,” she noted. Twitchell is a case worker for the social services department. The pantry is open to all tribal citizens regardless of income. 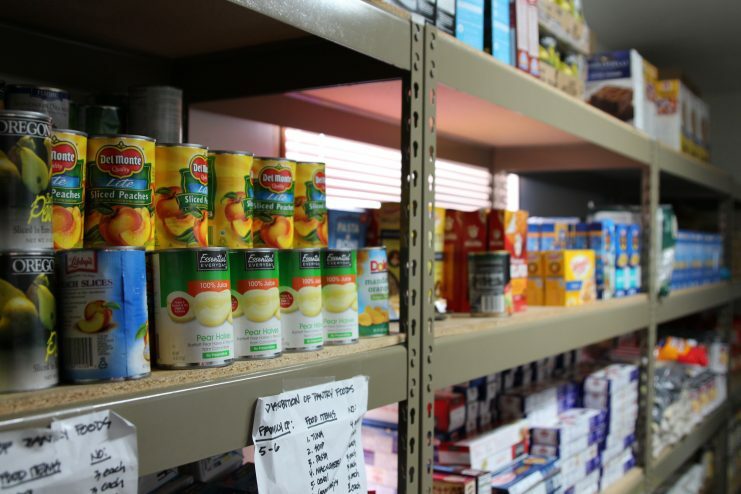 At the start of the month, staff go grocery shopping and stock the pantry with staple goods. Three weeks into August, when this interview took place, the shelves were mostly bare. “A lot of people are using their food money to pay utilities and rent and cost of living expenses. We are seeing a spike in our [pantry use] numbers,” Twitchell said. Food insecurity in Sitka has deepened and also broadened. Jean Swanson, an outreach family caseworker, said she’s seen tribal citizens come into her office seeking help that never did before. Both Swanson and Twitchell trace the upswing in pantry use this past year to the closure of Sitka’s public assistance office in June 2017. The district office, operated by the state Division of Public Assistance, is where locals could walk in the door, apply for food stamps, Medicaid, and other benefits, and have a technician on hand to help navigate the system. The closure was the result of attrition. It made financial sense to the state in an era of budget cuts. The Juneau office took over Sitka’s case load and did what it could to keep up with demand, but eventually, the backlog grew and grew… and grew. Individuals were unable to renew their food stamps, formally known as SNAP benefits (Supplemental Nutrition Assistance Program). Without them, more Sitkans were going hungry. Approximately 10% of Sitka’s population uses food stamps. Susan Briles, SEARHC and others began to submit complaints to the state ombudsman, as did other communities in Alaska experiencing their own delays. Twitchell and Briles even brought the issue before Sitka’s Health and Human Services commission. In 2018, the state ombudsman investigated the Division of Public Assistance and found a backlog of 20,000 applications. Their report was released in May of this year. You can read it here. And in June, to the relief of many, the state re-opened Sitka’s office. The office is housed in the same building as Sitka’s trial court. Applications are still processed elsewhere – this time in Ketchikan – but the two local positions have been re-hired. Southeast Regional Manager Victoria O’Brien says it will take awhile to train the new staff and get caught up on Sitka’s case backlog. “As of right now, we’re doing what we can with what we have and working as much as we can, encouraging our staff to work as quickly as possible as accurately as possible and to get as much done as they can in a day,” O’Brien said. There have been other positive changes since the ombudsman’s report. The legislature approved funding for 20 new public assistance positions and the department is working on a statewide delivery model that would allow technicians to process applications from anywhere in the state. “It’s not such a bottleneck now, but it definitely hit Sitka hard. It hit families hard. It hit elders especially hard,” Twitchell said. STA wasn’t the only pantry cleaned out. Sitkans Against Family Violence has seen their stock dwindle. Salvation Army is feeling the pressure too. They are the biggest pantry in Sitka, cycling through 10,000 pounds of food a month. About three quarters of local donations come from Sitka’s groceries stores. The rest is supplied through the U.S. Commodity Supplemental Food Program.But, it’s not enough to meet the need in Sitka. Major Charleen Morrow moves through the dining area and greets the clientele, as steam rises from bowls on the table. It’s lunch time. She and her husband Matthew took over the job in June. In the past year, they’ve seen clientele at the soup kitchen nearly double, from 25-30 meals a day to 50 meals a day. Donations for the pantry are not enough, so the Salvation Army spends $600 a week on groceries to keep the shelves full. Frozen meat is one of the first things to go. Morrow echoes what Sitka Tribe is experiencing: that clients aren’t just homeless individuals, but families and senior citizens. She worries about the physical toll food insecurity can take. Morrow says it’s hard for those families to come to Salvation Army for the first time. Like Sitka Tribe, Salvation Army does not verify the income of a person seeking help. Their mission is built around the idea that anyone can fall on hard times and that times right now are especially challenging. Editor’s note: Victoria O’Brien serves on the CoastAlaska board.